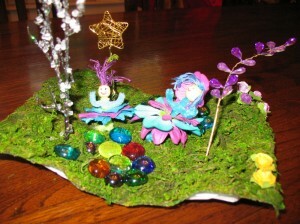 I’m catching up on the birthday party craftiness with the cute little gardens that we made for our fairies. 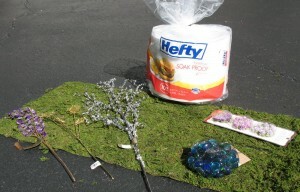 I bought a peat-moss-looking table runner as well as some vase fillers and pretty little scrapbooking roses at Michael’s. I cut the table runner up into small-ish pieces and glued them onto three stacked-up styrofoam plates to make the base of the garden. They have lovely styrofoam blocks for this purpose, but they’re surprisingly expensive. This was sort of the weak link in the craft, because it was sometimes difficult to poke things into the foam. Still, it worked out. The beautiful branchy-looking things are from Experience in Schenectady, which is right across the street from the main downtown library. It is absolutely not a child-friendly store: just walking into it with anyone under 6 is enough to make you break out into stress hives due to all of the delicate items, and they even say “no strollers” at the door. Mostly it’s home decor stuff that’s way too fancy and expensive for me, but in the back there are aisles packed with all sorts of stuff that makes you want to get crafty: fake flowers and fruits and birds and beads. Again, a little expensive, but I took one large branch and cut it into little miniature trees and ornaments for the fairy gardens, so it wasn’t too bad. It would also be a good source if you wanted to some sort of extra-nice crafty gift. It was a fabulous success. The girls at the party spent a good 35 or 40 minutes crafting away, which you know is a long time, especially when there’s a house full of different toys and a table full of punch and Cheetos mere steps away. When I woke up the next morning, M & J were busy using up the extra craft materials to expand their fairy homes and families. What’s nice, too, is that it’s not glued, so they can pick up the pieces and rearrange with wild abandon. Phew! Everyone had fun and we’re still trying to finish off the cake. It was nice to have an extra day to recover.